David Foster Wallace has written about “Roger Federer as religious experience". It is surprising that no one has thought of writing “Serena Williams as feminist experience" yet. It’s ripe for the picking, but, sadly, I won’t be able to offer myself for the job, because Serena Williams, when she burst on to the scene around the turn of the millennium, represented for me everything I disliked about women’s tennis, or, to be more specific, the direction in which it was heading. You see, I had grown up hero-worshipping Steffi Graf, adoring the traditionalism and stiff upper lip of Wimbledon, and looking at women’s tennis as a sporting discipline that allowed women to excel without turning them a little bit into men. Middle-class Kolkata of the 1980s and the environs of an all-girls school didn’t help. I didn’t know any girl who played an active sport. Yes, India’s top-ranked woman chess player was a school senior, but, then, chess was all about fantastic things happening in someone’s head. One of my mother’s students (in the all-girls school where she taught) played cricket for a Maidan club, but she sported a boy’s cut and always wore shirts and trousers and a steel bangle on her left hand, which made her more of a dada than a didi. It took Graf and that magical year of 1988 to drive home that women too were destined for great things on the field. Wimbledon 1988 was special. 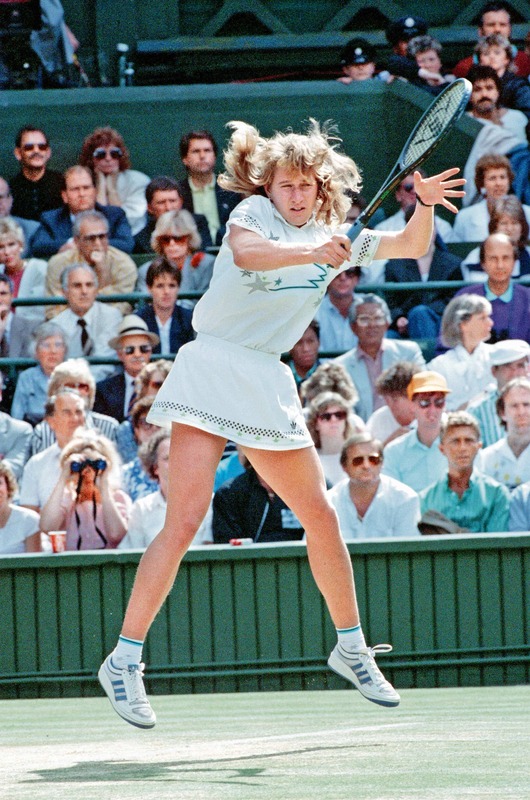 Graf was already a rising star, and breathing down world No.1 Martina Navratilova’s neck. The rivalry with the Argentine gazelle Gabriela Sabatini was beginning to look promising too, especially after the previous year’s three-setter semi-final at Roland Garros, which Graf won, before beating Navratilova to win the title. The year started bright and sunny for Graf, with wins at the Australian and French Opens—beating Chris Evert and Natalia (later Natasha) Zvereva, respectively, a generational sweep of sorts. The final at Roland Garros was a 6-0, 6-0 affair against Zvereva, less than a fortnight before Wimbledon, so a smooth cruise was anticipated. As it turned out, the only set she lost that Wimbledon was to Navratilova in the finals. Victory at the US Open rounded up the Calendar Grand Slam, but the icing on the cake was the Olympic gold at Seoul to complete the unparalleled feat of the Calendar Golden Slam. In our Enid Blyton worlds, Graf was the new foreign girl joining fourth-formers at Malory Towers—prodigiously talented, well-mannered, shy, learning to fit in, and someone whom even the caustic Mam’zelle wouldn’t have been able to find fault with. Even the later revelations about the unscrupulous father were entirely in keeping with the Blyton universe, where new girls often had dark secrets. Graf was to Wimbledon what James Bond is to Omega—the perfect brand ambassador. One could almost hear Rufus, Wimbledon’s beloved pigeon-scaring hawk, screeching in approval. In those years spent folding and refolding our skirts at the waist and practising the Graf serve before the mirror, taking care to wipe the sweat from the brow with the index finger, we did not question why Florence Griffith-Joyner, of the flashing eyes and floating hair (and long nails), who was setting Tartan tracks on fire at around the same time, didn’t elicit the same kind of adoration. By the time our perspectives were reset, questions had begun to crawl out of the woodwork. Why did we consistently apply different parameters for the men’s and women’s games, for instance? In his essay, David Foster Wallace writes—and remember, he is writing about Roger Federer—“Beauty is not the goal of competitive sports, but high-level sports are a prime venue for the expression of human beauty…great athletes seem to catalyze our awareness of how glorious it is to touch and perceive, move through space, interact with matter. Granted, what great athletes can do with their bodies are things that the rest of us can only dream of. But these dreams are important—they make up for a lot." And yet, you would hardly come across the word “beauty" in a report describing a Becker-Edberg, or a Connors-McEnroe match, while you could trip and fall over the surfeit of “beauty", “grace" and “elegance" in descriptions of Graf or Evert. Think of how big an issue Monica Seles’ grunting was, or the periodic revival of the skirt-length and skirt-versus-shorts debate, and you will begin to identify where and how the narratives part. To look at women’s tennis from around 1988, 20 years into the Open era, to its 50th year, 2018, is to observe the impacts of the feminist movement. And Wimbledon is always a good place to focus if you want to see how the bastions fell. It was Wimbledon that decided, way back in 1884, that women were too fragile to play five sets, after a player fainted—more likely from wearing tight corsets and those cumbersome bustle skirts than playing a long match. Wimbledon was also the last Grand Slam to equalize the prize money of men’s and women’s champions. The retractable roof over Centre Court, which eliminated the need for frequent rain-breaks in 2009, also ushered in a symbolic break from the old order. It was only fitting that in the first finals on the covered Centre Court, Serena and Venus Williams faced each other—two faces of the bold new era in women’s tennis. Nearly a decade has passed. And Serena Williams finds herself once again at the centre of a piece of women’s sporting history. Starting with the 2018 Wimbledon, women returning from pregnancy breaks will not have to start from scratch as unseeded competitors. When Margaret Court—whose record of Grand Slams Williams is chasing, incidentally—was missing competitions to give birth to, and nurse, children through most of the 1970s, nobody was making a case for special provisions to ensure more mothers returned to the court. Should Williams lift the Venus Rosewater dish, tennis historians can go ahead and mark this Wimbledon as the mother of all Grand Slam tournaments. In the summer of 2004, I made my way to the All England Club while counting the notes in my wallet to make sure I’d be able to support myself for the rest of my stay after buying the £15 ticket (around ₹ 1,350 now). Centre Court and Court 1 were out of bounds, obviously, but all the other courts were covered by my ticket. The second round had just started, so all the courts were occupied, and I was spoilt for choice. I could easily walk up and talk to a Martina Navratilova or a Conchita Martinez, but the male stars weren’t as visible or approachable. After spending an entire day watching the better part of seven matches, savouring the ambience, I felt a sense of déjà vu. I came from a place full of quaint old institutions like this, where great premium was placed on tradition and deference. There were gendered rules and gendered roles, and everyone followed without asking why. I have a feeling the All England Club of circa 2018 is a different place.